Brand New Personalised Baby Boy Keepsake Box. This beautiful memories box measures 23 x 16.5 x 10cms. The lid is embroidered with BABY. 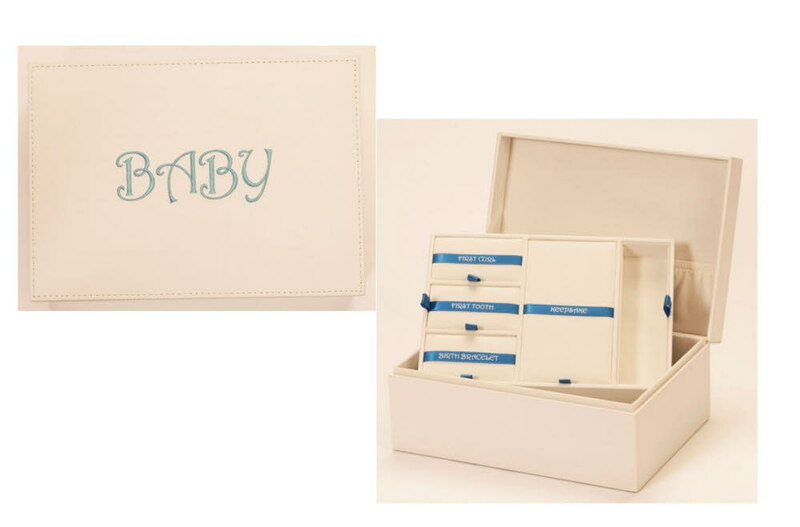 The lift out tray has ribbon name bands for each compartment, first curl, first tray, birth bracelet and keepsake. The box is fully lined and has ample space in the bottom for additional treasures. The memory/keepsake box comes with an engraved plate that you can personalise with any text that you require that is affixed to the outside of the box. Please detail your requirements in the Customisation box and enter the text that you would like. The box is white and the text is stitched in blue. This makes an amazing unique keepsake for all of your special Baby Memories.